It is not just things that carry stories with them. Stories are a kind of thing, too. Stories and objects share something, a patina. I thought I had this clear, two years before I started, but I am no longer sure how this works. Perhaps patina is a process of rubbing back so that the essential is revealed, the way that a striated stone tumbled in a river feels irreducible, the way that this netsuke of a fox has become little more than a memory of a nose and a tail. But it also seems additive, in the way that a piece of oak furniture gains over years and years of polishing, and the way the leaves of my medlar shine. “I really don’t want to get into the sepia saga business,” Edmund de Waal says in the Prologue to The Hare with Amber Eyes, “writing up some elegaic Mitteleuropa narrative of loss.” This self-consciousness about the kind of story he will, or can, or should, tell is one of the most interesting elements of the saga he eventually does write up. It is, inevitably, a narrative of loss — and why, really, should it not be elegaic? It’s nostalgia he wants to avoid, “about all that lost wealth and glamour from a century ago” — but why? Where, how, do we draw a line between treacly nostalgia and heartfelt lamentation? Or is it only what he would be nostalgic for that gives him pause? Is “lost wealth and glamour” not something to mourn? What about the art, the beauty, such wealth enables? They take the silver candlesticks held up by slightly drunken fauns from the dining-room, small animals in malachite from mantelpieces, silver cigarette boxes, money held in a clip from a desk in Viktor’s study. A small Russian clock, pink enamel and gold, that rang the hours in the salon. And the large clock from the library with its gold dome held up by columns. They have walked past this house for years, glimpsed faces at windows, seen into the courtyard as the doorman holds the gate open while the fiacre trots in. They are inside now, at last. This is how the Jews live, how the Jews used our money — room after room stacked with stuff, opulence. These are a few souvenirs, a bit of redistribution. It is a start. . . . 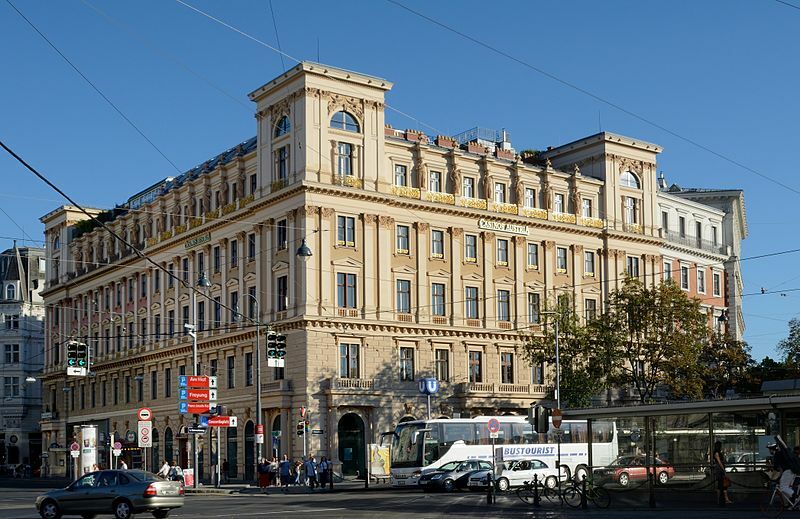 They push Emmy and Viktor and Rudolf against the wall, and three of them heave the desk and send it crashing over the handrail until, with a sound of splintering wood and gilt and marquetry, it hits the stone flags of the courtyard below. The enumeration of the Ephrussis’ beautiful objects seems designed to make us feel their excess, and also to feel, as the desk hits the ground, “You can spare this — it is not the worst loss you could suffer.” After all, they themselves are spared, and what’s a desk, or a candlestick, or a clock, to their lives? I know that I feared, at this moment in the story, that much worse was to follow for Emmy and Viktor and Rudolf. 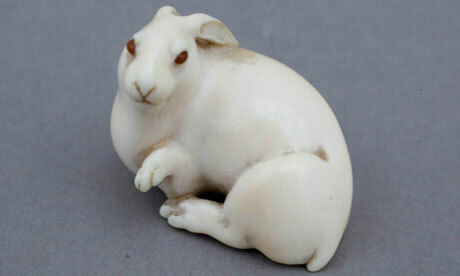 The survival of the netsuke in Anna’s pocket, in her mattress, is an affront. I cannot bear for it to slip into symbolism. Why should they have got through this war in a hiding-place, when so many hidden people did not? I can’t make people and places and things fit together any more. These stories unravel me. What sense does any of it make — what or who is lost, what or who is saved? De Waal is right to be squeamish about the “slip into symbolism,” and right not to make more sense of it than he does: all he can do is tell the story, up to the limits of what he can find out. But the story he’s telling is a story of objects, and for all that we feel the impropriety of caring about the recovery of 264 tiny carvings when “65,459 Austrian Jews had been killed,” de Waal also emphasizes, across the book as a whole, that things routinely outlive their owners, are passed along, given away, inherited. Objects do last; art could perhaps be defined as objects that are meant to last. Every object that endures has a story longer than the story of any individual owners. That doesn’t make objects more important than people, but it creates an interesting counterpoint of caring, and raises many thought-provoking questions about how we understand what matters. It’s not as simple, de Waal’s book asserts, as choosing life over art, people over things — or, it seems simple until you try to explain why. The destruction of the beautiful desk, for instance, seems so gratuitous, until we recognize that the heave over the handrail is not really about gilt or marquetry but about power and anger and hatred: in its own way, that act is as disrespectful of life, of humanity, as any of the physical cruelties the Ephrussi family suffers — or it is, at any rate, part of the same spectrum of horror. To refuse to mourn that loss is to capitulate, at least a little, to the logic of the looters, who see around them only expensive “stuff” to which the watching family has no right. But the Nazis do value the art they loot, in a way: this chilling episode is followed by a very different, methodical pillaging that benefited museums all over the Reich. What they don’t care about is the kind of story de Waal is telling, the intertwining of objects and people. Or maybe they understand it only too well and know that by breaking up collections they are furthering their work of erasing identities, like the official stamps (“‘Israel’ for the men, ‘Sara’ for the women”) that finally make de Waal cry. For me, de Waal’s book — though it is about other things too — was most thought-provoking and powerful when it dealt with this intersection between people and their things. It’s too easy to take the attitude that possessions are only material goods. Sure, we can do without many of the things we have, if we are fortunate enough to have many things that are, strictly speaking, excessive to our needs. Once those minimal needs are met, though, things we accumulate can play many different roles and can carry a great deal of meaning. I was reminded of The Mill on the Floss and “Mrs Tulliver’s Teraphim“: George Eliot understood, too, how our possessions can be tangible aspects of our lives and characters — not symbols, but actual pieces of our lives. For rooms covered in gold, it is very, very dark. The walls are divided into panels, each delineated by ribbons of gilding. The fireplaces are massive events of marble. The floors are intricate parquet. All the ceilings are divided into networks of lozenges and ovals and triangular panels by heavy gilded mouldings, raised and coffered into intricate scrolls of neoclassical froth. Wreaths and acanthus top the heady mixture. All the panels are painted by Christian Griepenkerl, the acclaimed decorator of the ceilings of the auditorium of the Opera. Each room takes a classical theme: in the billiard room, we have a series of Zeus’s conquests — Leda, Antiope, Danaë and Europa — each undraped girl held up by putti and velvet draping. The music-room has allegories of the muses; in the salon, miscellaneous goddesses sprinkle flowers; the smaller salon has random putti. The dining-room, achingly obvious, has nymphs pouring wine, draped with grapes or slung with game. There are more putti, for no good reason, sitting on doorway lintels. Who would not feel charity for a prebendary when walking the quiet length of that long aisle at Winchester, looking at those decent houses, that trim grass-plat, and feeling, as one must, the solemn, orderly comfort of the spot! Who could be hard upon a dean while wandering round the sweet close of Hereford, and owning that in that precinct, tone and colour, design and form, solemn tower and storied window, are all in unison, and all perfect! Who could lie basking in the cloisters of Salisbury, and gaze on Jewel’s library and that unequalled spire, without feeling that bishops should sometimes be rich! Maybe it’s because the netsuke themselves are so small, so unassuming, that they carry us through this difficulty so well. Though they are worth a lot of money, they aren’t out of our reach — anyone’s reach — the way allegorical paintings and putti are. They are an intimate art form, and the story that de Waal tells is also an intimate one, of parents and children and cousins, of friends as well as patrons, lovers as well as great artists. As the fortunes of the Ephrussi decline, the world of the netsuke contracts and becomes less elite, more domestic: from Charles Ephrussi’s elegant Paris house, where they share the honors of display with paintings by Renoir and Degas and Monet, to the marble Palais Ephrussi on the Ringstrasse in Vienna, to a house in Tunbridge Wells and then to Japan, where we have first seen them in the cabinet in the Tokyo home of de Waal’s great-uncle Iggie. Finally, they take up residence in a vitrine de Waal salvaged from the Victoria and Albert Museum, “in [his] Edwardian house in a pleasant London street.” Is this a come down or a coming home? If de Waal had written the kind of story he feared, a “sepia saga,” we might see the netsuke as remnants of a lost golden age. But that would never have really been their story, which did not, after all, begin when Charles Ephrussi bought them as “a complete and spectacular collection from Sichel.” There’s so much that we still don’t know about them, such as how they came to be together in that collection. 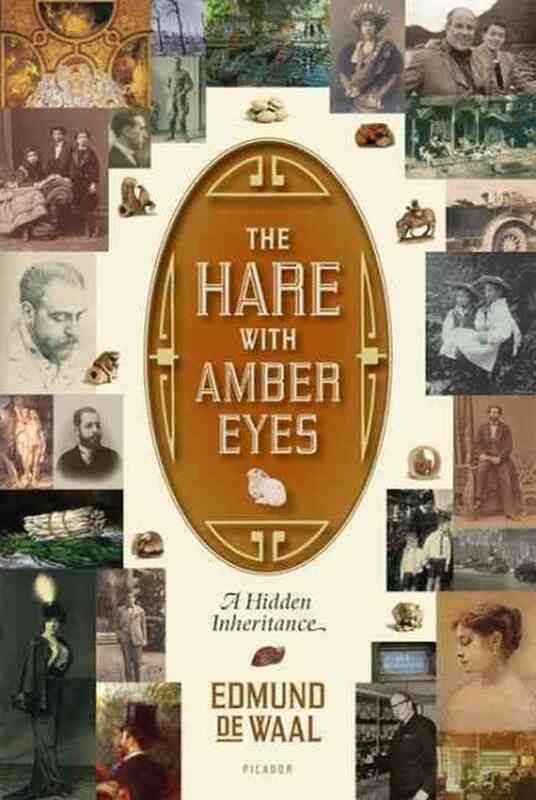 Through The Hare with Amber Eyes we’ve also never lost sight of what the title immediately emphasizes: their particularity. They are not 264 of the same thing but 264 different, highly individual, carvings. If I were to risk a “slip into symbolism” of my own, I might say that they represent the proliferating individuality of the people who have surrounded them — bought them, displayed them, but above all, handled them. Although the book ends, their story is not over: “the netsuke begin again,” de Waal concludes. From their perspective, he is only their latest custodian. For a book that is rich with both human love and human tragedy, then, The Hare with Amber Eyes ends by making all that activity seem eerily fleeting: these tiny objects remind us to question our own self-importance, or perhaps to measure it by how we serve them, the objects that make up our lives. I’ve worried how I would construct a life entirely through objects. Rohan, this is a marvellous analysis of a marvellous book. For a follow-up go to de Waal’s website to see his own work. It’s fascinating to read the narratives he weaves around his installations of repetitive ceramic objects. I really appreciate that – thank you. I know it’s a book that has meant a lot to you. I agree that it is marvellous. It surprised and moved me in so many ways. Do you have the illustrated edition? I would like to see that: I kept wishing for more pictures. But his descriptions are wonderfully specific. What an excellent review. This brought the book back to me but from some unusual and intriguing perspectives. Thank you! Thanks for a very stimulating review! Though they are very different, I was reminded of A.M. Homes’ short story collection, “The Safety of Objects” which ponders the same question you and de Waal do. Set in North America of today (or 1990), the sepia saga is entirely avoided. Thanks for this excellent review. I wasn’t able to put those connections together when I read this, and found de Waal almost squeamish about emotion and “symbolism.” I thought — why *not* write a narrative of loss? After all, that’s what this is. I found the book compelling and fascinating, but the hesitation to engage, the focus on the fleeting objects rather than the people, irritated me. Your perspective makes it much clearer. Thanks, Jenny! It’s the kind of book that provokes these kinds of questions that we were both asking — his anxiety about how to balance the human and the aesthetic stories helped me, and also kept the book from being predictable in its overall arc. One thing I like about blogging is that I could come at the book a bit sideways like this, pursuing a question or theme rather than ‘covering’ it: if I were trying to write a straightforward review I think I would have felt obliged to walk through the parts of the book in a more literal way. Yes, I like that about blogging, too. I usually feel the necessity to give a brief “what is it about” paragraph, but then all bets are off, and I can talk about whatever questions I found most engaging! One of my resolutions is to be a better part of your commentariat this year. I like it here, for all these reasons. I’m glad you’ll be around! One of my New Year’s resolutions is to be a more visible reader / commenter on blogs too, including Shelf Love, which is always a favorite. I understand why the standard advice is “don’t read the comments,” but happily that warning is almost never necessary among the book blogs I follow, where the comments are a a big part of the whole point. I love the connection to Eliot’s “Teraphim” chapter. This book hits so many little paths I intermittently follow that I always enjoy reading about it. I did not have anything like Jenny’s reaction since Sebald had trained me in reading de Waal, which makes sense in that Sebald’s books seems to have trained de Waal in the writing of this book. I have been known to gently correct people who say “never read the comments.” Some of my own posts are best read as context for the superior comments they attract. I actually have the Novel Readings comments in a separate RSS feed in my reader, so I never miss any of them.